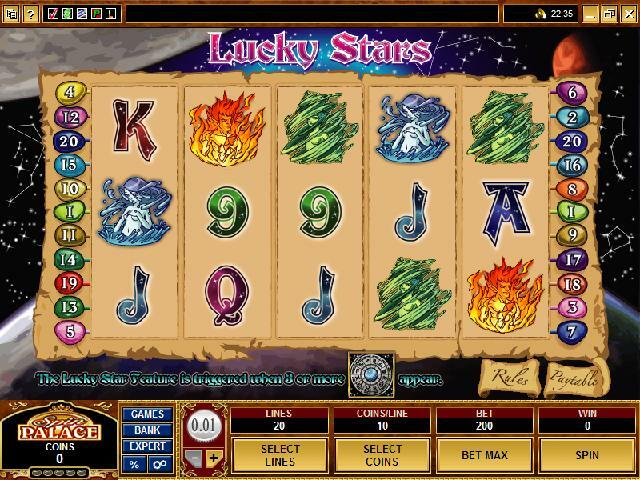 Enjoy an exciting adventure in this great 5-Reel, 20-Payline, Multi-Coin Video Slot - Lucky Stars! 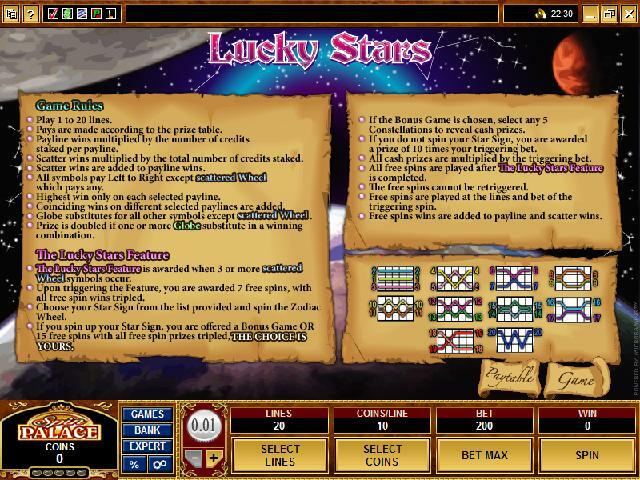 With its colourful, zodiac theme, Lucky Stars promises to deliver hours of gaming entertainment and includes a Wild and Scatter Symbol, a 'Pick X of Y' Bonus Game plus, as well as a generous Free Spins Bonus Feature. A Crystal Ball will help you navigate the star map to good fortune, it is Wild and substitutes for all symbols (except the Scatter). Should the Crystal Ball substitute in a new winning combination your win is instantly doubled! Three or more of the magical Zodiac Wheels will not only award 7 free spins where all wins are trebled but they also serve as the scatter and the trigger for an out-of-this-world bonus feature, giving you choices on how to go further. Enter the bonus level by selecting your star sign from the 12 mystical symbols on the ancient Zodiac Wheel. 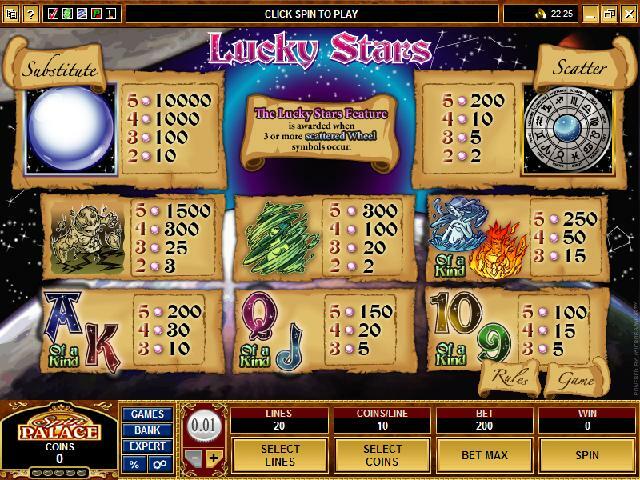 If you spin up your star sign, you are presented with 2 options - 15 Free Spins, during which all wins are tripled OR the Constellation Pick Bonus Game, where you choose 5 constellations to reveal cash prizes. And don�t worry if your star sign doesn�t spin up, as a consolation prize of 10x triggering bet is then awarded. Experience a universe full of fun and entertainment, and plenty of opportunity to try your luck and WIN!